Since 1992, the place to watch music on the box has been Later with Jools Holland. I never miss it because via some pedestrian pub rock, like Kasabian, or some thoroughly odd but compelling Mongolian nose flute singers, you might see someone you’ve never heard of who blows you away. You can’t help but wonder how those acts got booked in such sought-after slots. You’ve never heard of them and yet, with their two given songs, they are all you’re talking about to your friends the next morning. 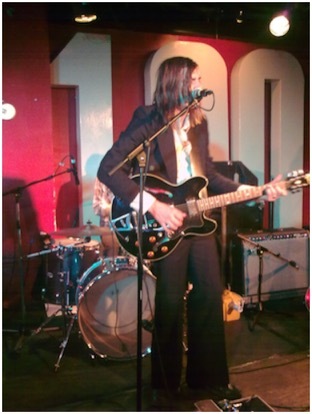 Last night at the 100 Club, both performances felt like a Later… treat. I’d planned to arrive late but by chance took a look at the 100 Club website and saw that the support was called Josephine – it turns out that this girl sounds like a cross between Tracy Chapman and Odetta and is from my very own manor, Cheetham Hill. Well. I had to see her. She was beautiful, charming, humble then confident, in possession of a superior talent for finger-picking and had a voice you could listen to sing anything. The songwriting was raw but all she needs is a proper break. Very impressive. In my life, I never thought I’d hear anyone sing a song about Cheetham Hill. I must have been the only other person from there in the room and it was a surreal moment, one that gave me an inner smile. Thanks to Uncut, in any given month I will download at least ten albums that they have recommended in reviews or articles. Last month, they gave a fabulous review to Pauper’s Field, the debut by a 20-year-old Louisiana boy, and the son of a Muscle Shoals session musician, called Dylan LeBlanc. When listening, one can’t help but be staggered at how these country blues tales of regret and lost love, sung with a world-weary voice, over mournful pedal steel backings, could possibly have come from the heart of a kid barely out of his teens. A little Townes Van Zandt, a little Neil Young, with the delicate sonic and visual beauty of Nick Drake and Jeff Buckley, he seems out of his time. He’s already had a stay in rehab, confessed with bashful contrition in a recent Guardian interview, for booze and pills and you have to hope some marketing department doesn’t get hold of him and push him too far and too fast. I remember the first time I heard Kings of Leon, a good, solid, no-nonsense band. And then I blinked and they got sucked into the machine; hair was cut, beards were shaved and they were made MOR. Except the drummer of course, you’ve got to keep one of them ‘dangerous’ looking since the PR company told you some of the target market wants a bad boy. The gritty, swamp blues-rock of their first album was long gone, replaced by Grammy-bland stadium pub rock. This is what can happen to musicians from the South; their God-fearing but happily hedonistic personas get boxed up nicely into something an X Factor Idol Who’s Got Talent auditionee can strain out. At least, since he’s signed to Rough Trade, I have hope that LeBlanc can get the guidance and support he needs without contrivance. A vision of Southern charm, imbued with politeness and a fringe to hide behind, he gently walked onto the 100 Club stage to make his London debut. With a few pints to steady his nerves, he later confessed, it was only when he smiled shyly that could you see this was a lad who looks like he doesn’t shave yet. At any other time, leading his band of hot rednecks, who look like they’re straight out of Bon Temps (think Sam Merlotte), he’s confident and turns out song after song of undeniable quality. The opener Low had a country strut, the ballad 5th Avenue Bar was played with tenderness on solo acoustic, he played Death of Outlaw Billy John with a nod to Americana and The Band and, even without the Emmylou Harris backing vocals, If The Creek Don’t Rise, with its epic swirl, had the small crowd enraptured. All of this while looking like a Massey Hall-era Neil Young. The crowd wouldn’t let him leave, even after he’d thrown in a couple of covers – one by Van Zandt and a quite brilliant heavy blues rendition of Grandma’s Hands by Bill Withers – and he had to play pretty much every song he knew. It was a laid-back but compelling performance. A broken string here, a quip there, he was engaging, gifted and unique. One can only look forward to how good he’ll be when he’s 30.